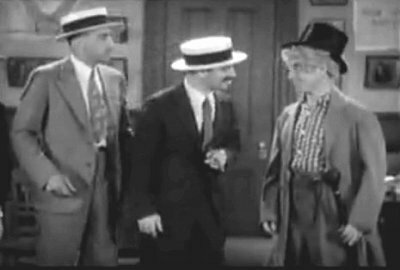 The first scene of I'll Say She Is depicts the four Marx Brothers as they enter a theatrical agency, one by one, and try out. Zeppo's part is bigger and more important than it ever was in the feature films. Instead of being "the fourth man through the door", he is the Marx Brothers' interpreter in the worlds they invade. In I'll Say She Is, this scene began with the song Do It and also included an Assistant Theatrical Agent and a Second Office Girl. Theatrical Agency originally appeared in the Marxes' vaudeville-show On The Balcony in 1921, so it gives us an idea of what the brothers were like then. However, the imitation done by the Marxes in the skit was changed over the years. They seem to have alternated between imitations of their uncle Al Shean and his partner Ed Gallagher and the stuttering comedian Joe Frisco respectivally in various performances of On The Balcony and I'll Say She Is. According to Glenn Mitchell in The Marx Brothers Encyclopedia, they switched to impersonations of the more famous Charlie Chaplin while performing On The Balcony in Britain in 1922. It also seems as each Brother had his own rhyme. Zeppo opened the succesion of imitations with the line "My name is Sammy Brown and I just came into town". Harpo's (read by the agent from a card) was the anti-thesis of Zeppo's; "My name is What-Do-You-Care, my home is anywhere..."
In 1931, Paramount put together a film called The House That Shadows Built, in recognition of their 20th anniversary. They date back to 1912, with the release of a feature film of the legendary stage actress Sarah Bernhardt playing Queen Elizabeth. What follows are glimpses of dozens of the studio's silent-era stars. The film closes with a cavalcade of forthcoming Paramount features and clips from what then were the latest studio releases. 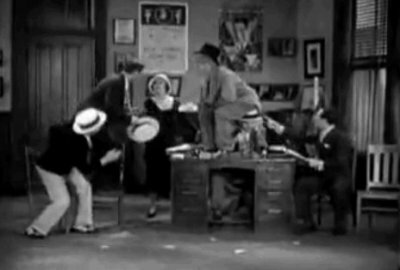 Promoting their upcoming film Monkey Business, the Marxes returned to the Theatrical Agency, this time imitating Maurice Chevalier (then under contract to Paramount) and his song You Brought A New Kind Of Love To Me from Paramount's The Big Pond. 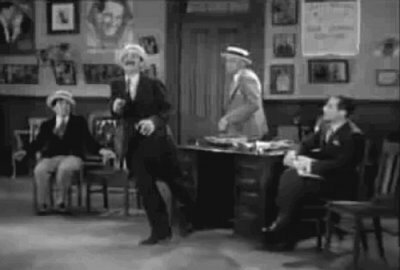 The lyrics include a reference to "nightingales", and the fact that the Marx Brothers started their performing careers as Nightingales, gives an extra dimension to the song, as do the fact that Marxes Zeppo and Gummo actually became theatrical agents themselves in the 1930s and 1940s. Version 1 from 1921 is found at the On The Balcony-section. Version 2 is from the Library of Congress, stamped 10 November 1924 and unearthed by fellow Marxonian Peter Sprenkle. 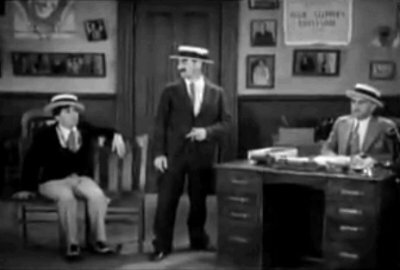 Version 3 is the Monkey Business-trailer from 1931. A Real Video-version of the trailer can be found among many other items at Frank M. Bland's site Why A Duck, in the Real Audio & Video-section. Comparing these versions may be like watching three different performances of the show and experience the various ad-libs. It also shows that version 3 from 1931 more closely resembles version 1 from 1921 than version 2 from 1924.